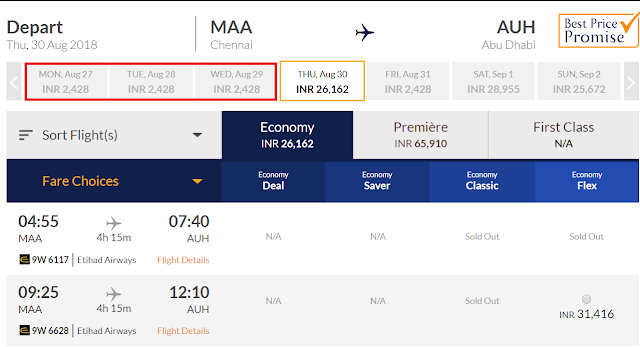 Jet Airways website shows prices for adjacent days while booking a ticket. While I was checking for ticket price to Abu Dhabi, suddenly I saw that ticket price is just INR 2428 on some of the days. That was impossible- if true, we are in for a jackpot. Fortunately or unfortunately, the bug was short lived. The website was retaining fares from previous search- I had searched Chennai-Madurai, Chennai-Mumbai etc before searching for Chennai-Abu Dhabi. Website was showing Madurai fares for other adjacent dates. However when I clicked on those dates system did recover and showed me correct increased price. So I wasn't able to book on those dream fares to Abu Dhahi. The joy was short-lived. Still this is a bug Jet Airways team should consider and fix. Have you ever managed to book on impossibly low fares- known as mistake fares?